The amazing principle of Kolossal Kisser is taken to a whole new level in this Kolossal Kicker . An already fantastic principle is further expanded into an unconventional and totally unexplored territory with immense possibilities. There are significant additions to the basic method which add many layers of deception and make the routines all the more baffling and entertaining. 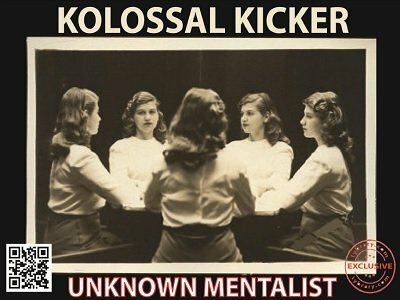 Kolossal Kicker contains the following four routines. Right in the beginning the performer keeps in full view his prediction in a sealed envelope. A participant is given a list of about 80-90 words in which all the words are unique and no words are repeated. The participant is asked to randomly choose any one word from the list. There is absolutely no force. And this choice matches the prediction in a stunning manner. Here again there is a sealed prediction in full view right from the beginning. From a list of about 70-80 different places all over the world, a participant is asked to randomly choose any one place - again no force. All the places are unique and none are repeated. And this choice matches the performer's prediction in an unbelievable manner. The theme here is about imaginary or mythical places from popular books like Percy Jackson, Lord of the Rings, Harry Potter etc. A participant is asked to randomly choose any one mythical place from among a list of about 80-90 such fictitious places. Again her choice matches the performer's prediction in an absolutely amazing manner. In this list too, none of the places are repeated and all are unique. From a list which mentions about 80-90 common emotions experienced by human beings in their daily life, a participant chooses an emotion randomly and this again matches the performer's prediction in a baffling manner. The list contains all different and unique emotions and none of them are repeated. All the four routines are based on different but clever extensions/expansions of the basic Kolossal Kisser principle. Now consider the following for what the method is NOT. The envelope is ungimmicked and there is really only one prediction card inside it. No verbal jugglery. Nothing written down by the participant. No other prediction cards are used except the one in the envelope. The routines are almost impromptu and completely self working and easy to perform. You can start performing them right after reading the instructions, although perfecting your presentation is always a good thing. You will surely fall in love with this principle and the unconventional expansions described and will start having your own ideas for using this in many other ways. All Magic effect's new and old will never ever be suitable to meet every ones taste and skill in the magic/mentalism field of entertainment. What they do which is guaranteed is to stimulate any one’s mind to read practice and adapt to their own style of presentation and most of all. All effects can and do is to stimulate Old and young minds to produce new thoughts and ideas for any performer to bring old and most importantly new effects to entertain and amaze the public and spectators. We as entertainers and writers can never please every one. But what we can is to stimulate the readers open minds I like the writer's work and adapt to my own style ironing out anything that I think does not suit my style or performance all of his works so fare are in my working library Including this one. I never got to performing Kenton's Killer much - as it needed a complete wallet to be fully 'occupied'. Now this new principle is amazing. Wonderful method to predict one out of about 80 variables with just one prediction in an ungimmicked envelope. It is so clean, fair and extremely clever. The drama of missing closely and then rising like a phoenix to a fantastic climax is very gripping. None of the 80 or so words/places/emotions are repeated and the clever variations render the routines as true workers. I will be doing words, places and emotions - mythical places is really not my cup of tea. The hard work for all these routines is already done and I just have print out a paper and go to business. A very nice package of great ideas. Good that I caught this at the intro price.